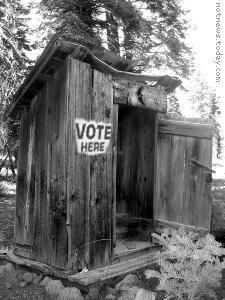 BOOTH OF DESPAIR, Ohio, Tuesday (NNN) — Americans today committed egregious acts of democracy to elect the next failed administration and the next failed Congress. In a fabulous upset, almost no-one could bring themselves to vote directly for either of the official candidates, instead opting for a write-in vote. Popular write-ins included “the black guy”, “the old guy”, “McCain from 2000” and “Tina Fey.” The seventeen votes for “The Invisible Man” were tallied for Joe Biden. Several tons of Liquid Paper needed to be scraped off voting machines. The winning candidate turned out to be Noneof Theabove, 46, of Dogshit, Nebraska. Apart from the Presidency, Mr Theabove won 72% of Congressional seats and all Senate seats up for election this year. Mr Theabove’s policies include drinking, shouting abuse at the television and inchoate existential despair. “He completely embodies the national mood,” said Nate Silver of FiveThirtyEight.com, just before applying for a new job flipping burgers. A majority of US soldiers in Afghanistan stated the place was “just fine, really” and they were learning to speak Pashto rather than returning. Canada looked south and snickered, though not very much as they still had Stephen Harper to cope with. The Kingdom of Mexico stated its “regret” today that it has had to close its borders to American refugees. Ha! Great Post! My 12 yr old voted for “Pedro” in his school election. When the votes were tallied and 1% was for Pedro, he was thrilled!